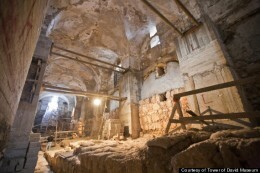 Visitors can see remains of King Herod’s palace in Jerusalem, where the trial of Jesus may have occurred. Photo: Courtesy Tower of David Museum. Visitors to Jerusalem’s Old City can explore remains of King Herod’s palace, which may be where Roman governor Pontius Pilate tried and condemned Jesus of Nazareth to death. Excavating from 1999–2000 underneath an abandoned Ottoman-period prison known as the Kishle—which is part of the so-called Tower of David complex—Israel Antiquities Authority archaeologist Amit Re’em uncovered the foundation walls and sewage system of Herod’s Jerusalem palace. Tours offered through the Tower of David Museum will showcase these finds. Although the discovery of the remains of Herod’s Jerusalem palace has recently made headlines, the finds are not surprising, according to University of North Carolina at Chapel Hill archaeologist Jodi Magness. “We have other remains of the substructure of Herod’s palace, and its identification as the praetorium [the Roman governor’s residence and headquarters] is not new, either,” Magness told Bible History Daily. If evidence of Herod’s Jerusalem palace has long been known, why is it in the news now? Media attention, which has focused on Herod’s palace as the possible location of the trial of Jesus, has coincided with the Tower of David Museum’s opening of the site for tours. The preparation of the site, The Washington Post reports, was delayed by wars and a lack of funding. Where Was the Trial of Jesus? Excavations conducted under and in the vicinity of the Tower of David complex have uncovered evidence of Herod’s palace. Photo: Wayne McLean/CC BY 2.0. For Christian pilgrims, the identification of the praetorium with Herod’s palace might throw off the route taken for centuries to retrace Jesus’ steps from his trial to his crucifixion. Called the Via Dolorosa, or “Way of Sorrows,” the road begins at the Antonia Fortress and ends at the Church of the Holy Sepulchre, punctuated in between with seven other stations commemorating events that occurred on Jesus’ way to his crucifixion at Golgotha. Although the path of the Via Dolorosa has long been venerated, Tower of David Museum director Eilat Lieber told The Washington Post that she hopes Christians will eventually make Herod’s palace complex near Jaffa Gate a standard destination. This Bible History Daily article was originally published on January 8, 2015. 1. Shimon Gibson, “The Trial of Jesus at the Jerusalem Praetorium: New Archaeological Evidence,” in Craig A. Evans, ed., The World of Jesus and the Early Church (Peabody, MA: Hendrickson Publishers, 2011), pp. 97–118. See also Shimon Gibson, The Final Days of Jesus: The Archaeological Evidence (New York: HarperOne, 2009). 2. Mark 15:16; Matthew 27:27; John 18:28. 3. Jodi Magness, The Archaeology of the Holy Land (New York: Cambridge Univ. Press, 2012), pp. 158–159. 4. Gibson, “The Trial of Jesus,” p. 104. Lawrence Mykytiuk’s full article from the January/February 2015 issue of BAR with voluminous endnotes. James Tabor on Jesus’ Davidic Lineage and Dynasty. Ehud Netzer, “A New Reconstruction of Paul’s Prison: Herod’s Antonia fortress,” Biblical Archaeology Review, January/February 2009. Stephen J. Patterson, “The Dark Side of Pilate,” Bible Review, December 2003. Thomas Schmidt, “Jesus’ Triumphal March to Crucifixion,” Bible Review, February 1997. Jerome Murphy-O’Connor, “The Geography of Faith: Tracing the Via Dolorosa,” Bible Review, December 1996. @Felix is mixing up his Herods. The Herod to which the “Herod’s Palace” refers is King Herod the Great. Since Herod Antipas was only Tetrarch of Galilee and Perea and NOT king of the Roman province of Judea, he would only be in Jerusalem for certain events such a Passover. Thus, the Palace would have been normally used by the Romans. However, it IS possible that being a compound, both Roman Prefect Pilate & Tetrarch Herod could have been in different parts of it, probably as far apart as possible! Most of the enormous area included in the dimension from Josephus has not been built upon. It would be available for excavation except it is the Armenian Cemetery. I would think archeologists drool over the idea of going there. I would believe that the proetorium would be located in Fort Antonia and perhaps lavish Roman tiles like the ones that they discovered on the so called temple mount were part of the lavish furnishings of the building. I believe the whole thing called the temple mount IS Fort Antonia, where Jesus was tried, perhaps, on the very rock that is enshrouded by a mosque. It is already said that such stones are found in many Herodian structures elsewhere, and it did not have to be found in the temple. Only the presupposition that the temple was in the enclosure that is now so contested would make folk think such stones were from the temple. Now I am not sure at this moment (concerning the rock) that the stones were found from excavations over the Solomon Stables and how close that is to the Dome of the Rock to say Jesus was tried while standing on the rock. But I believe the temple mount is that small rise between the Enclosure I am calling Fort Antonia (now the so called temple mount) and the old city of David, and happily so if the Jews can quickly and silently acquiesce that area, maybe even cheaply and build some future temple there to their hearts delight. Some scholars usually neglect the information on the New Testament itself. One strong biblical reason for Pilatos not staying on Herod’s palace was that he and Antipas – Herod’s son – were enemies until that date (see Lk 23,12). Although Pilatos had a powerful position, Antipas influence and right over the palace could not be so easily underestimate. According to Josephus, the fortress was built on a rocky eminence 50 cubits (c. 22 m; 73 ft) high. Above the rock, it had stone walls 40 cubits (c. 18 m; 58 ft) high and four corner towers, three of them 50 cubits (c. 22 m; 73 ft) high and the other, at the southeast corner overlooking the whole temple area, 70 cubits (c. 31 m; 102 ft) high. (The Jewish War, V, 238-247 [v, 8]) Prior to Herod’s time the fortress served primarily against incursions from the N, but thereafter it mainly served as a point of control over the Jews and a means of policing the activities in the temple area, to which there was direct access from the fortress. The square layout of the fortress would indicate that it had a central court. Some believe that it was in such a central court within this tower that Jesus appeared before Pilate for judgment. (Joh 19:13) They suggest that a stone pavement found in this area was the one referred to as “Gabbatha.” Others, however, believe that Jesus’ judgment by Pilate took place before Herod’s palace. The Greek term prai·to′ri·on (from Lat., praetorium) designates the official residence of the Roman governors. In the governor’s palace at Jerusalem, Pontius Pilate questioned Christ Jesus, and in its courtyard, Roman soldiers mocked him. (Mr 15:16; Joh 18:28, 33; 19:9) Some have identified the governor’s palace with the Tower of Antonia, but others suggest that it was probably the palace built by Herod the Great. The following reasons have been presented in support of the latter view: (1) According to the first-century Jewish philosopher Philo (The Embassy to Gaius, XXXIX, 306), Herod’s palace was called “the house of the governors,” and it was there that Governor Pilate hung shields in honor of Tiberius Caesar. (2) The Jewish historian Josephus reports that the procurator Gessius Florus took up his quarters there. (The Jewish War, II, 301 [xiv, 8]) (3) Herod’s palace in Caesarea served as the governor’s palace in that city.—Ac 23:33-35. The palace of Herod at Jerusalem was situated in the NW corner of the upper city, that is, of the southern part of the city. According to Josephus’ description, it was surrounded by a 30-cubit-high (13 m; 44 ft) wall equipped with evenly spaced towers. Within the walls there were porticoes, courts, and groves of trees. The rooms were luxuriously furnished with gold, silver, and marble objects. There were bedchambers for a hundred guests.—Jewish Antiquities, XV, 318 (ix, 3); The Jewish War, V, 173-182 (iv, 4). A paved place at Jerusalem where Roman Governor Pontius Pilate sat on the judgment seat when Jesus Christ was before him for trial. (Joh 19:13) The site was called, in Hebrew, “Gabbatha,” a word of uncertain derivation and possibly meaning “hill,” “height,” or “open space.” The Greek name for it, Li·tho′stro·ton (Stone Pavement), may indicate a tessellated pavement, one of ornamental mosaic work. “The Stone Pavement” where Jesus appeared before Pilate was in some way associated with “the governor’s palace.” (Joh 19:1-13) It may have been an open area in front of the palace of Herod the Great; some scholars favor identification with a site near or a central court within the Tower of Antonia, NW of the temple grounds. But the exact site of The Stone Pavement remains unknown. All that is left is a small fraction of the whole palace that Josephus described. Hundreds of thousands had seen it, no one objected to his report. A simplified model is at the Holyland Hotel in Jerusalem. The footprint of the Palace is a close match to the Armenian Cemetery and has never been excavated. There is so much more to learn.